Words: Isaac Watts, Psalms of David, Psalm 98, 1719. This version differs from the original by Watts. Music: "Antioch," Lowell Mason, 1848. Mason's original score said "from George Frederick Handel." However, scholars who have studied the issue state that none of the music actually comes from Handel's work. The tune is named after the city of Antioch, Syria, where believers were first called "Christians" (Acts 11:26). 1. Joy to the world! The Lord is come. Sheet Music from Henry Sloane Coffin and Ambrose White Vernon, eds., Hymns of the Kingdom of God. New York: The A. S. Barnes Company, 1910, #37, P. 73. Sheet Music from T. C. O'Kane, et al., eds., Joy To The World, or Sacred Songs for Gospel Meetings. (Cincinnati: Hitchcock and Walden, 1879), No. 1, p. 1. Also found in Roundell Palmer, ed., The Book of Praise. Boston: Sever, Francis, & Co., 1870, # XLIV, pp. 51-52. "Genius" and "at his best ... unapproachable" are accolades not dispenses to everyone who has taken pen in hand. These lofty plaudits plus "the bard of Southampton" and "father of English hymnody" have been showered upon Isaac Watts (1674-1748), the author of "Joy to the World!" Only one other English-language hymn writer, Charles Wesley, the lyricist for "Hark! The Herald Angels Sing," is seriously compared to Watts. If a choice had to be made as to which of these two great hymnists has made the larger historical contribution, the decision would probably go to Watts. A nonconformist pastor and prodigious author of theological and philosophical books (about 60) and hymns (about 700), Watts is most remembered for the extraordinary hymns, "When I Survey the Wondrous Cross," "Our God Our Help in Ages Past," and "Joy to the World!" The renowned nineteenth-century English author Matthew Arnold considered "When I Survey" to be the best hymn in the English language. "Our God" has been described as "England's second national anthem," and "Joy" ranks in the very top level of Christmas songs. First published in Watts' 1719 work, The Psalms of David, Imitated in the Language of the New Testament, "Joy" was a paraphrase of the second part of Psalm 98. Originally the opening line read "Joy to the earth," but eventually the better term "world" entirely supplanted "earth." 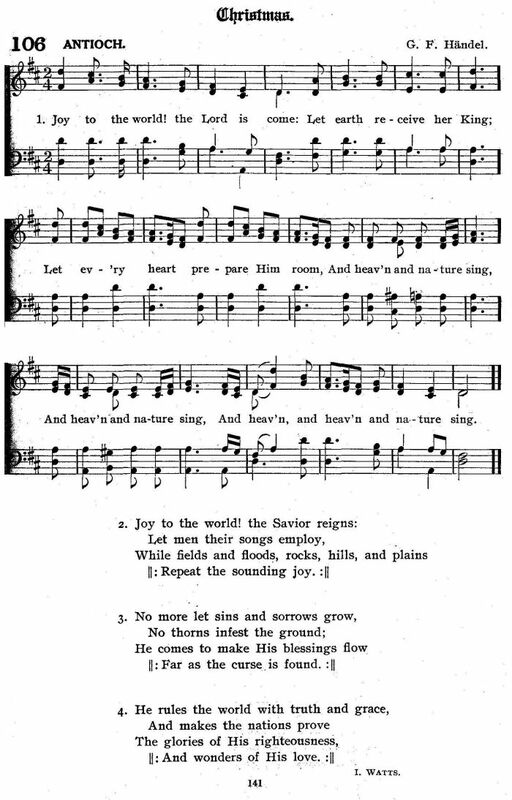 Over a century after Watts' carol lyrics first appeared, it was printed with a splendid, dynamic tune in an 1839 collection entitled The Modern Psalmist. The sole indication of authorship for the melody was the cryptic notation "from Handel." Because of this strange wording and some similarities between parts of the tune and parts of the Messiah, the superlative 1742 choral work by George Frederick Handel (1685-1759), the melody has almost universally been attributed to the English music master. Yet the links to Handel are very weak and tenuous and scholars have basically refuted the hypothesis of Handelian authorship. In spite of the uncertainty about the tune's origins, there is no doubt that the carol synthesized by the joint talents of the father of English hymnody and the father of American hymnologic anonymity has few peers in quality or international popularity. Both words and music, carried along by extremely esthetic conveyances of term and tone, joyfully proclaim the birth of Jesus. Of all the sacred carols, "Joy" is perhaps the most positive and uplifting declaration of the message of Christmas. The exclamation point almost universally inserted by carol editors after the initial line, "Joy to the world!," powerfully punctuates the exhilarating effect that this carol has had for the past century and a half. If this carol brings you a true sense of joy, it may be because the music is drawn from George Frideric Handel’s inspiring masterpiece, "The Messiah." Handel was born in Germany in 1685. Though his father wanted him to be a lawyer, George smuggled a piano into the attic where he would practice. Fortunately for us today, he studied music in Italy, and later he chose England for his home. Handel wrote some of the greatest operatic, choral, and sacred compositions of all time. One of these, "The Messiah", is an oratorio performed every Christmas season by choral groups around the world. If you would like to see exactly where the melody for this carol comes from, borrow the score for "The Messiah" from your library, or listen to a recording. 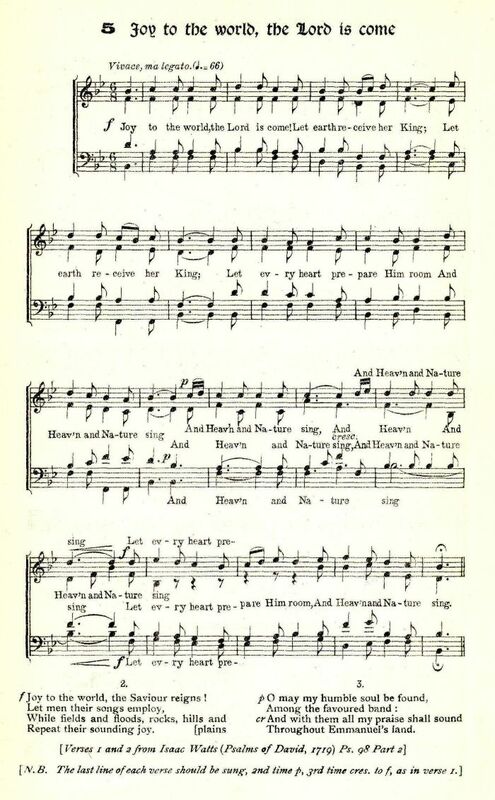 The first four notes of "Joy to the World" (in the key of D) can be heard in the first four notes of the chorus "Lift Up Your Heads," in the original key of F. The middle section of the carol (...and heaven and nature sing) can be found in the slow temple instrumental introduction of the opening recitative solo, "Comfort Ye My People." The origins of this tune have yet to be completely uncovered (the attribution to Handel probably results solely from the resemblance of the opening to ‘Lift up your heads’ in Messiah). 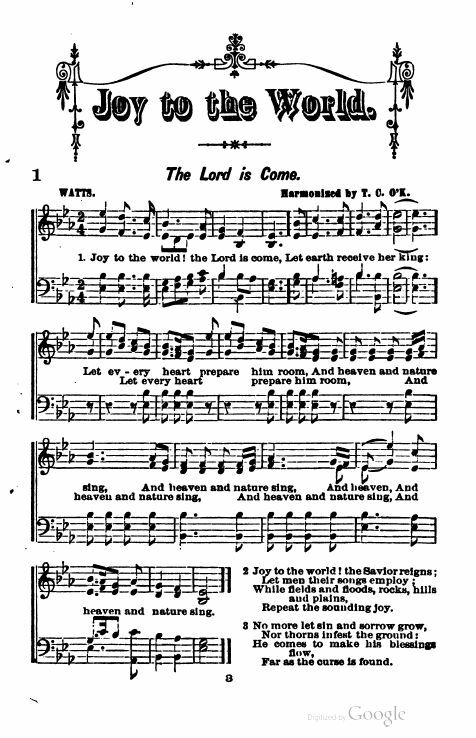 It first appears as an English psalm tune in the 1830s, and was set to Watt’s text, a paraphrase of Psalm 98, by the America Presbyterian Lowell Mason in 1836. NOBC setting II is an arrangement by Thomas Clark of the English version of the melody. 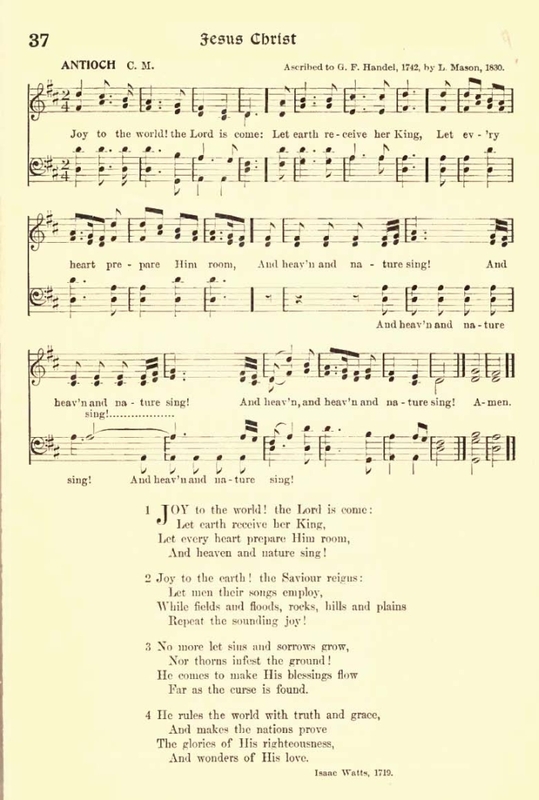 Though the triumphant words "Joy to the world" exemplify the Christmas feeling, this familiar text is actually a translation based on five verses from Psalm 98 in the Old Testament, Isaac Watts, the English hymnist and cleric, published his Psalms of David, which contains these verses, in 1719. More than a century later, in 1839, American composer and music educator Lowell Mason decided to set them to music modestly including the phrase "From George Frederick Handel," apparently to honor his idol, the composer of Messiah and many other masterpieces. For nearly l00 years, the world accepted this ascription, until musicologists pointed out that not a single phrase in the music can be said to have come straight from any work of Handel’s. Isaac Watts published the words for this hymn in 1719. He had written his first hymn in 1692 at the age of 18 as a protest against what he thought was the low quality of songs in Anglican hymnals. A century after he published "Joy to the World" the words were set to a tune devised by Dr. Lowell Mason from a theme in Handel's "Messiah." Best recording: Anna Moffo. And heav'n and nature sing. Issac Watts included this hymn in his Psalms of David Imitated in the Language of the New Testament in 1719, as part of his version of Psalm 98 (vv. 4-9). Despite the fact that some words in the hymn also appear in the psalm, it is difficult to find any close connection between the two. While the initial stanza announces that "The Lord is come," it is the only stanza that is related to Christmas and the birth of Jesus. The other stanzas could easily be appropriate for any season of the year. There is no mention of Mary and Joseph, the shepherds, the manger or the wise men. Yet, who would deny this hymn a choice place among the traditional carols? For more than a century the hymn was sung to numerous tunes which fit its poetic structure (Common Meter). Then, in 1839, Lowell Mason, a New England music educator, published in Boston a tune that has become indelibly associated with these words. Mason indicated that it is "from Handel," for he borrowed two musical phrases from Handel's Messiah ("Lift Up Your Head" and "Comfort Ye") and wove them into a joyful song for Christmas. Mason named the tune "Antioch" for the ancient Syrian city that was the point of departure for Paul's first two missionary journeys and where the disciples were first called Christians (Acts 11:26). Isaac Watts based this jubilant Hymn on psalm 98 which declares, "Shout for joy to the Lord. ..burst into jubilant song with music." This melodic instrumental by Don with its lighthearted acoustic guitars and delicate piano with a touch of joyous strings captures the excitement of this ecstatic praise. We pray that you will filled with joy to the Lord as you experience the thrill of praise to God that is captured in this piece. Isaac Watts is no doubt the greatest of all English hymn writers. Son of Nonconformist imprisoned twice for his religious views, Watts learned Greek, Latin, and Hebrew under Mr. Pinhorn, rector of All Saints, and headmaster of the Grammar School in Southampton. Isaac’s taste for verse showed itself in early childhood, and his promise caused a local doctor and other friends to offer him a university education, assuming he would be ordained in the Church of England. However, Isaac declined and instead entered a Nonconformist Academy at Stoke Newington in 1690, under the care of Mr. Thomas Rowe, pastor of the Independent congregation at Girdlers’ Hall; Isaac joined this congregation in 1693. As with many hymns by Isaac Watts, born into an Independent (i.e. Congregational Church family) this one is a Christianized versions of a Psalm - in this case Psalm 98, The Psalms of David, 1719. The verses were not set to music until nearly 100 years later, when, in the 1830s, the American composer and music educator Lowell Mason, put them to a tune he ascribed to 'George Frederick Handel'. For the next 100 years people believed this to be the case, the tune certainly having echoes of the Messiah choruses, but it is now thought to be Mason's own Handelian-influenced composition. The tune is named after the city of Antioch, Syria, where believers were first called 'Christians'.